The Beauty Junkie - ranechin.com: Happy Beautiful Year with Watsons! 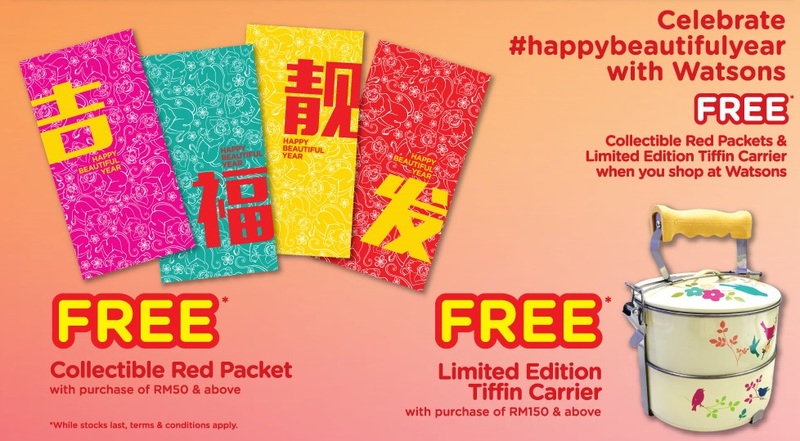 Watsons usher into the New Year with the ‘Happy Beautiful Year’ campaign and spearheading this with a Chinese New Year music video featuring the original produce song ‘Happy Beautiful Year’ and cameo appearances by more than 20 top Malaysian celebrities. The music video is led by five main casts namely Annie Pang, Choong Lai Chan, Julie Chew, Vivian How and Winnie Ho who were casted in after a few rounds of audition with award winning production house Woo Hoo Pictures. The music video was co-directed and produced with Watsons marketing team and the shooting of the music video took place in November 2015 at various locations. To showcase diversity in the music video, Watsons also invited top Malaysian personalities for cameo appearances in the music video. The celebrities line up include Amber Chia, Leng Yein, Point Blanc, Dato’ Lai Meng, Dato’ Kee Hua Chee, Kit Mah, Nadine Ann Thomas, Nadia Heng, Hansen Lee, Juwei, Dr Shazril Shaharuddin, Reem Shahwa, Mark O’Dea, Nancy Marcus, Livonia Ricky, Stevensunny and Willy Tan. The storyline and content of the music video showcases Malaysia’s favourite past times together which includes singing and dancing with lively music and at the same time showing fun, laughter and humour in it. The music video which has been aired on paid TV and also Watsons Malaysia YouTube and Facebook channels, thus far has received more than 1.4 million views and nearly 18,000 shares since its release on 5 January! Watsons ‘Happy Beautiful Year’ campaign also brings a wholesome celebration to its VIP members. This year, Watsons is offering RM1,000,000 worth of prizes for the Scratch and Win to its members with any purchase worth RM50 in a single receipt. Watsons customers too can enjoy the great sale up to 50% from 21 January onwards while shopping at Watsons can be even more rewarding with attractive gifts with purchases during the prosperous New Year including a collectible red packets in four exclusive design and a limited edition tiffin carrier. During the prosperous New Year, Watsons VIP members too can look forward for more rewards including lucky 888 new VIP members sign up can win more than 788,888 worth of VIP points. Besides that, members can look forward to be the lucky 8 members to receive RM800 worth of Oriental Restaurant vouchers each. 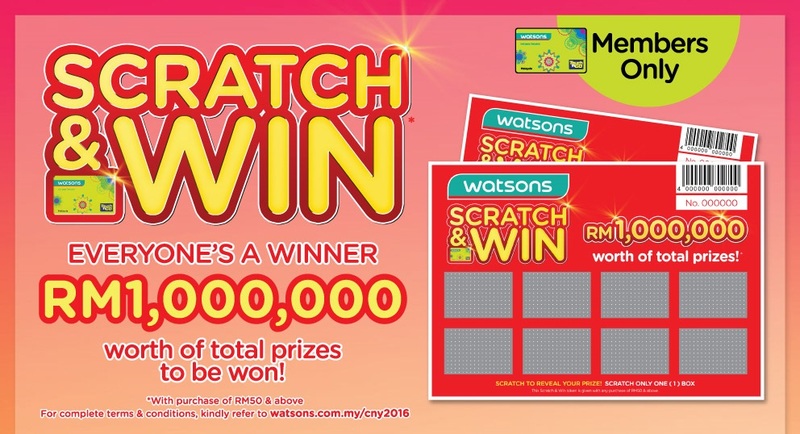 And to Watsons members on LINE, look out for amazing RM5 worth of points giveaway to lucky 888 members. Apart from that, existing Watsons VIP members can look forward to exclusive up to 10x points and exclusive member’s offers plus prosperous gifts with purchase of selected items in store and Online Store. 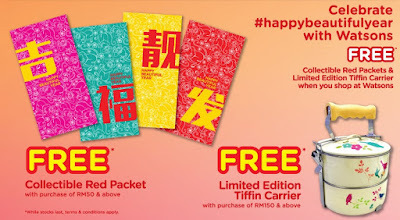 When purchasing from Online Store, online exclusive for Watsons VIP members gives an even bigger rewards with redemption of Watsons Tencel Masks at RM2, dining vouchers from Din Tai Fung, Hui Lau Shan, Baskin Robbins at RM6 and GSC Gold Class Tickets to watch a CNY movie at only RM8 per ticket!